While the jury might still be out on this one, what we do know is that eggs are the cherry on top when it comes to chicken keeping. But how much do you really know about these nutritious gems? We’re here to set the facts straight and and tell you eggs-actly what you could ever want or need to know about eggs! A chicken egg can be either fertilized or unfertilized, and is the perfect little package (an average-sized egg weighs about 50 grams, however this will vary depending on the chicken breed), comprised of seven basic parts; the shell, membranes, the albumen (white), the yolk, the chalazae, the germinal disc and the air sac. 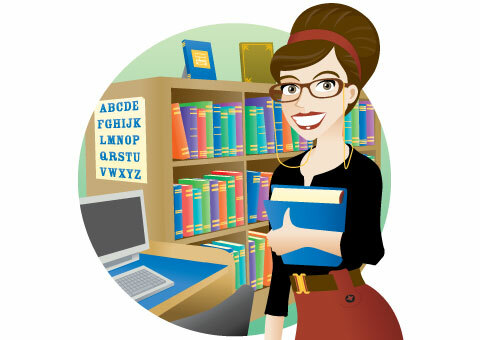 Each of these parts have a particular job to do and serve a certain purpose. Shell: The eggshell is a very fascinating piece of engineering, housing the entirety of the eggs components within it. It is made up almost entirely of calcium carbonate, and covered in tiny pores, which give the egg it’s grainy texture. The shell is a semipermeable membrane, which is just fancy talk for meaning that air and moisture can pass through it’s pores. It is also protected by a thin outermost coating known as the ‘bloom’ or ‘cuticle’, that acts as a natural barrier against external pathogens such as bacteria and dust. 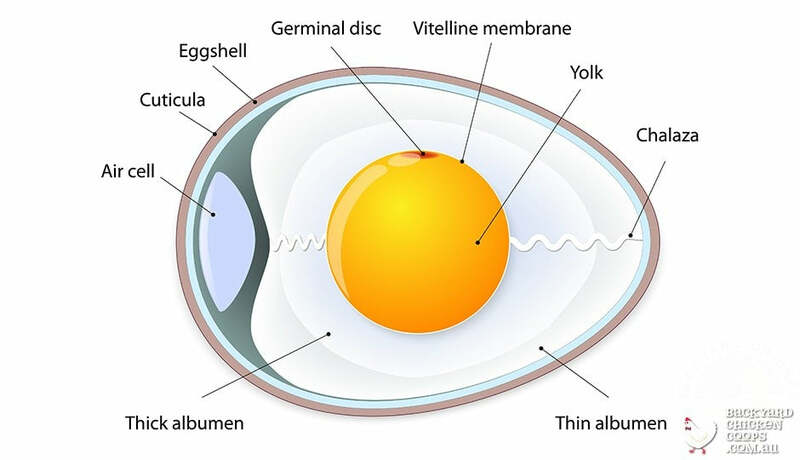 Membranes: The egg has two membranes-outer shell membrane and inner shell membrane, which both sit just inside the shell enclosing the albumen (white). These super strong transparent protein membranes, which are made partly of keratin, have the job of protecting against bacterial invasion. The outer membrane is secured to the egg shell, while the inner membrane sticks to the albumen. Albumen (White): The albumen, more commonly known as the ‘white’, is made up of vitamins, protein, minerals and water and consists of three main parts-an inner, middle and outer layer, each of varying thickness that surround and protect the yolk. These powerful layers contain an abundance of proteins that in a fertile egg will help with the chicks development, or if infertile, will be passed on to us! The Yolk: The yolk is the central part of an egg, and while usually yellow, its colour can vary depending on the chicken breed, ranging from a light yellow to a deep orange. This little powerhouse is where most of the proteins, minerals, fats and vitamins of the egg are housed, including Vitamin A, D, phosphorous, calcium, thiamine and riboflavin. Chalazae: Chalazae are part of the egg white and are strings of twisted tissue positioned at opposite ends of the yolk. They play the important role of stabilising the yolk and germinal disc to prevent twisting and misalignment in the egg. Germinal Disc: Also called the egg cell, or blastodisc, the germinal disc sits on the surface of the top of the egg yolk and is the ‘powerhouse’ of the egg, as it is where the sperm enters the egg. It is here that the embryo will form by a process of cell division and growth once fertilisation has taken place. Air Sac: Sometimes known as the ‘air space’ or ‘air cell’, the air sac forms when the contents of a freshly laid egg cools, causing them to contract. This air sac rests between the outer and inner membranes at the eggs larger end. As the egg matures, regardless of fertility, the air sac will expand due to moisture and carbon dioxide leaving the egg, and air entering the egg to replace them. A productive egg layer really does first and foremost depend on the chicken breed, so ample research should be undertaken in this regard if you’re wanting chickens for the sole purpose of their egg producing capabilities. (Backyard Chicken Coops has a great article for the best egg laying breeds here). As well as this they need to be provided with a balanced and nutritious diet (high in protein and calcium), fresh water, plenty of sunlight, as well as nesting boxes that are conducive for egg laying (fresh straw, spacious, and out of the way of direct sunlight or drafts). A female chicken is born with a full complement of eggs in her body, and depending on the breed, will produce many or very few eggs over the years. 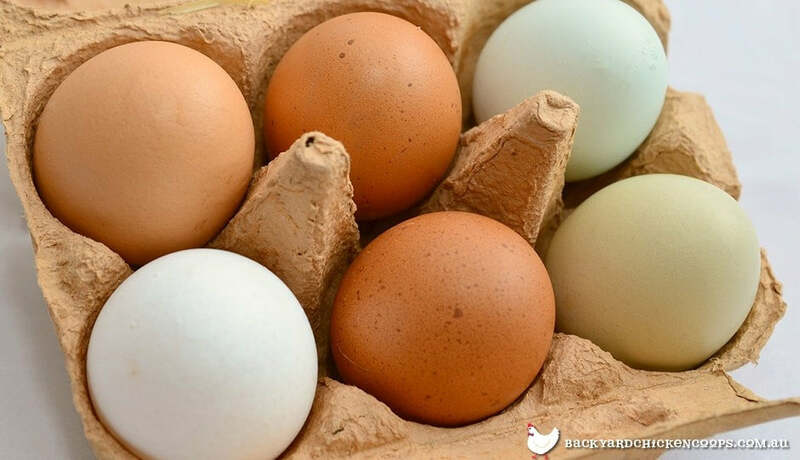 Chickens have thousands of tiny ova, which are undeveloped yolks in their ovary, and when they have matured, an ovum will be released into the oviduct where it will begin it’s great journey of development. A hen can have many eggs at different stages of development within her reproductive system at one time. Those at the beginning of their journey are just tiny yolks, whereas the eggs that are further down the oviduct are noticeably larger and more developed. It takes approximately 25 hours for an egg to reach the vent ready for laying from the time it leaves the ovary. In this time the yolk will grow and become encased by the albumen, wrapped in a membrane and then enclosed in a pigmented shell-voila! Fresh eggs for all! The first stage of embryo development occurs in the blastodisc (germinal disc), which will become known as the blastoderm once fertilized, and it contains genetic material from both the chicken and the rooster. If housed in the right conditions, either through incubation or from a hen, these cells will then develop into a chick embryo, where it will grow and further develop, getting nourishment from the yolk and albumen. After 21 days, the chicken will be fully developed and so the miracle of hatching will begin! We think it’s safe to say that there is definitely a lot more than meets the eye when it comes to the humble egg. So next time your girl lays one of these beauties take a moment to applaud and appreciate these natural wonders! Why Keep Chickens As Pets?